Recently, the Dawn spacecraft – on its circuitous route to the asteroid belt — used the gravity of Mars to provide a little ‘kick’ to the spacecraft’s velocity. Universe Today finally had the chance to catch up with the team from the Dawn mission following this maneuver to find out how things went, and how the spacecraft is doing following the gravity assist operations. “The gravity assist accomplished exactly what we needed to get on course for Vesta,” Dawn Chief Engineer Marc Rayman told UT. “In addition to the gravity assist, we decided to undertake some bonus instrument calibrations, taking advantage of flying by such a well-studied planet. In doing so, we obtained some performance data on some of our instruments.” The image seen here of Mars’ surface is one of the results of those calibrations. Dawn will be visiting two different asteroids, Vesta and Ceres. Because of its distinctive ion engine, the spacecraft will be able to enter orbit around Vesta in August of 2011, remain there until May of 2012, then leave orbit and head to Ceres, arriving in February of 2015. The thrusters work by using an electrical charge to accelerate ions from xenon fuel to a speed 10 times that of chemical engines. But what does this mean for a gravity assist – is there any difference between an ion engine versus and a chemical thruster in a gravity assist? 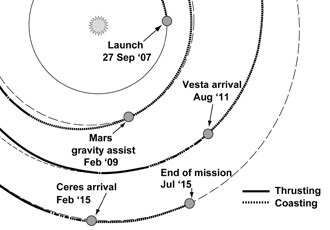 Generally, a gravity assist is used to increase a spacecraft’s velocity and propel it outward in the solar system, much farther away from the Sun than its launch vehicle would have been capable of doing. Dawn got as close as 549 kilometers (341 miles) to the Red Planet during the Tuesday, Feb. 17, flyby. JPL said that if Dawn had to perform these orbital adjustments on its own, with no Mars gravitational deflection, the spacecraft would have had to fire up its engines and change velocity by more than 9,330 kilometers per hour (5,800 miles per hour). At maximum thrust, each engine produces a total of 91 millinewtons — about the amount of force involved in holding a single piece of notebook paper in your hand. You would not want to use ion propulsion to get on a freeway: At maximum throttle, it would take Dawn’s system four days to accelerate from 0 to 60 miles per hour. Using the gravity of Mars was an important part of the Dawn mission that makes going to the asteroid belt possible. Oh… Yes apparently there was indeed at least one mistake in that statement. 2015 will be a good year for astronomy and exploration. Thanks for noting my typo. Its been fixed. Thanks for the black and white picture of Mars…..I hope you can take color pix someday. Cool article. I followed the motions of Vesta in the sky in 2007 and am doing the same for Ceres as it travels near 54 Leonis right now. Usually the arrival of Dawn is a disappointment for astronomers. Not, however, in this case. To produce colour, images taken through various different filters are put together. It’s an IR-filtered greyscale image – taken for one single purpose: to make sure Dawn’s framing camera works correctly, and to make adjustments as required. There are almost 10000 utterly stunning pictures there!!! Feenix – thanks for the info. Are those HiRise “color” picture true RGB, as a human would see them? Even when I click on the RGB, the shades look artificial. Instead of all this fancy blending, it would have been nice for all these multimillion dollar space missions to carry simple imager that every kid has in a $100 digital camera, and calibrated once on earth to show what a person would see. I’d also like to know if the “blueberries” are bluish at all – and does the dust seasonally cover and uncover them, and is that what the old-time astronomers saw as the “wave of darkening” they interpreted as plant life. Or do they actually change shade, and perhaps serve as home to some sort of microbe? All these interesting questions and over 50 years to time to do it….and we still don’t know if there’s life on Mars. Intriguing. Dawn is so cool, I can’t wait for it to arrive and start performing observations! Also check out that cool triangular dimpled feature near the left edge of the image, just below the middle – dunes or errosion? TD, I’m glad you enjoyed those images. About the colours…. some are more “realistic” than others. All are composites of different colour-filtered greyscale images, and many are enhanced to show certain minerals and textures, for scientists to get clues about what to expect when we get there, and about the geological (should probably be “areological”, but everybody says “geological”…) history. The most “realistic” ones are like greyscale (what most people call “black and white”) photos with a rustyt brown overlay…. quite dull to look at. Hey, hasn’t Ceres been promoted to Dwarf Planet? Sounds much more impressive than asteroid, doesn’t it? TD, tell me something: what do you think these “multimillion dollar space missions”‘ goals are? b) Snapping point-and-shoot type pictures so that you can print and decorate the walls of your bedroom? Jorge, I’m not sure if you meant it that way but your comment does come across a little ungracious. Don’t you think it’s enough that TD is interested in some aspect of the mission, even if that aspect is only a sideshow to you? Who knows what that interest might lead to. Bleeding obvious statement follows: No interest from the general population > no funding > no $ > no science. Being who were are these sort of photos are, scientific value aside, a great way of attracting interest form the folks paying the bill and also inspiring the next generation of scientists. Remember the 1st colour photo from the surface of Mars? How water cooler conversation provoking was that? Wait till Dawn gets to Vesta, and later Ceres. Then we will see exactly what the Framing Camera can do. Lots of science, AND lots of cool bedroom wall type images will come, I am sure of that! Actually, wandering by, this very same TD (I assume; alias such as his are a bit too easy to fake) already had all this stuff patiently explained to him before. Instead of at least trying to learn, he prefers to continue throwing snarky remarks about every monochrome or false colour image he sees. Under such circumstances, grace does get a little forgone, yes. In any case, what this little episode highlights, IMHO, is the need for someone at UT to write an article explaining the basics of space imaging. Then, whenever one of these protesters came about people would simply redirect them to that article. Previous PostPrevious What is Earth’s Magnetic Field?